All first aiders need to be requalified within 3 years of their certification date. Our Level 3 First Aid at Work Requalification will help to refresh your memory when it comes to first aid and safety in the workplace. During this 2 day course, you will learn how to deal with a range of situations, including those which are minor and life-threatening. The programme covers cross infection, basic equipment use, incident management and how to report emergencies in line with your company’s procedures. We will show you how to effectively treat patients in life threatening situations; for example, if they are unconscious, bleeding, choking, in shock, suffering from a seizure or aren’t breathing. Treatment of heart attacks, anaphylaxis, asthma and cardiac arrest will also be covered in this training course. You will be assessed by the trainer throughout the course and you will also be given practical and theoretical tests. To revisit key areas of first aid with the student so that they have adequate knowledge to deal with minor and urgent medical problems in the workplace. 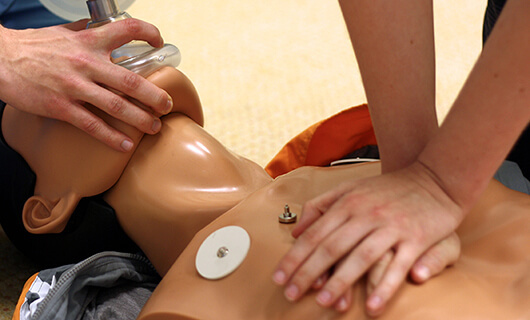 Candidates who hold a current First Aid at Work qualification may undertake this course. Their current certificate must not have expired more than three calendar months before completing the two day requalification. The Level 3 First Aid at Work Requalification is the perfect course for anyone who wants to renew their qualification so that they can continue in the role of company first aider.